Day 8 stone. Capturing a certain palette, rather than a form, I think. Fluffy clouds or speckled eggs? Definitely the color of budgies. We took the kids to Safari North, a wildlife park near us, today. Our favorite part is always the budgie enclosure. You get to walk in with a stick covered in bird seed and a hundred sweet little budgies land on you and eat the seed. I love seeing the kids grinning with birds lined up on their arms. These wild, unruly children of mine are so soft and gentle with these feathered gems. We also witnessed a mama kildeer defending her nest full of speckled eggs. When we approached she got all dramatic and pretended, pretty convincingly, that she was injured as she tried to lead us away from the area. We gave her space after getting a quick peek at her lovely eggs and she wiggled back down on her nest. The weekend has drawn to a close. 2 more days of my challenge left. Day 7 draws to a close. A drop of golden sun at the end of a glorious day. I spent much of my day working on a project but couldn't resist making dandelion stem bracelets and playing in the grass with my youngest on this cool but sunny day. I feel a sense of accomplishment and it's a good thing. I finished Day 6's stone late last night. I really wanted to go to bed. My tired self reasoned with the rest of myself that it would be okay if I just went to bed. But in the end I stayed up a little longer and stitched my stone. Just a simple design that hinted at the morning's rising sun. Day 5. A freeform stone. The color is reminiscent of my clematis, but the design was a free-flow, organic thing that happened just because I liked the feel of the stitches. I was in town 3 hours early to drop off a child for a field trip so I spent some time at my desk this morning stitching. I finished up the last few stitches after work with some of my best artsy friends while we shared a glass of wine and art talk. I'm looking forward to the slower pace of the upcoming weekend. Day 4 stone. Iron-rich like our soil and stones. Today is the kind of day that I find the most challenging. I missed out on sewing time before work today because my oldest was sick. Strep. I knew it as soon as I heard him talk. I just had it myself, the first time in like 15 years. Yuck. Off to the clinic, 25 miles in and 25 miles back, then 20 miles back in to work. After a busy day I came home with a head full of work and feeling oh so tired. This is usually when I get back into work email and end up tense for the evening. Instead, while the (healthy) kids went to splash in the pool (it's way too cold for me yet) I sat down and sewed. And you know what? There's still time for work email, but I tended to myself first, and that's the way it needs to be. Day 3's stone, full of moss. Started this morning after the kids got on the bus. Finished tonight before dinner. Instead of launching into emails and getting sucked in by pinterest, I went directly to my stitching. It was a good choice. My day 2 stone. A messy, wild version of lilacs. Their scent is thick in the air right now and I love it. It has been over 2 months since I've stitched a stone. I find that totally unacceptable, especially since I consider the act of stitching these little meditations a form of therapy. It's little wonder I've been so off-kilter. Life is very busy... busier than I'd like. Things get moved off the to-do list, shoved to the back of the line, to make room for the most pressing and noisiest of tasks. Regardless, stitching is going to have to be one of those things that is always on the list. It just has to. In late 2013 I was poised and ready to make the leap into full-time art. My youngest would soon be in school and I had a plan in place to make a real financial impact by working in my chosen craft. Then life laughed and winked, and threw us some curves which necessitated my going to work outside the home. I ended up in a job as an arts administrator, one I'm proud of and often humbled by. It's worthy work, but work that often drains me, physically and creatively. So it becomes even more important that I keep up with the practice of self-care which for me includes time in the woods, stitching, family, and working towards that goal of being a full time artist, even if it's years away. I'm starting by committing to 10 days of stone-stitching. No matter how busy or tired I am, I will stitch at least 1 stone every day for the next 10 days. At the end I'll have a shop update and a giveaway. I hope you'll be here to celebrate with me. Day 1's stone seems to have taken its theme from my dandelion-covered yard. Work life has been very busy lately. To make the most of my art time, I've been looking at ways to streamline my process a bit. I've been wanting to do a hanging piece with my stones, without having the weight of actual stones. 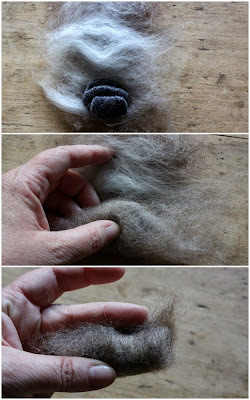 I've made solid wool stones before by needle-felting them firmly and then wet-felting them, but it takes time that I just don't have right now. This method allows me to make a batch of stones at a time with much less effort. If you've followed my tutorial for felted stones, this will be pretty self-explanatory. We'll substitute felted sweater for the stone, following the same steps, but allowing the washing machine to do the felt work for us. From the wool sweater, cut a basic stone shape. You'll want to cut one larger piece for the center, widest, part of the stone and two smaller pieces, one for the top and one for the bottom. No need to get exact here as the felting will alter the shape and make it nicely rounded. Next you'll lay out a little mat of roving for your stone slightly wider and about 3 times longer than your stone. Lay a thin layer out with the fibers running horizontally, and a second layer with the fibers running vertically. This will encourage the fibers to tangle together more easily around your "stone". Roll the wool "stone" up in the fiber, tucking the sides in and making a neat little package. Using your felting needle, tack the edges and ends in place. No need to needle the whole surface, just get it to stay put long enough to get to the next step. Now repeat those steps until you have a pile of little wool stones-to-be, and grab your stocking. If the stocking you're using has a seam in the toe, turn it inside out. I've found that the seam will make an indent in the stone, which is fixable, but easily avoidable. Now slide your first stone down into the toe of the stocking and tie a knot right above it. Now, if you want to make lots and lots of stones this way you can save up all your stone-filled stockings until you have a washer load full. If you want to make just a few, or if you are impatient, toss that stocking in with a load of jeans and let 'er go. I ran these for one cycle, but if you see they're not felting well enough, toss them in another load and let them go again. They're pretty gnarly looking when they're done. Get out your scissors and set them free. Cut above the knot and peel the stocking off of your stone. Whoa. The surface is pretty unruly, but that's okay, we can fix the surface. We're more concerned about the center being pretty well felted. That's the step that takes time if you were to do them by hand. These are well-felted so we'll just address that surface fuzz. Take your fuzzy stone to the sink and wet the surface with a little warm water and a drop of soap. Rub the stone using the plastic bag for about 30 seconds. Rinse off the stone and set it aside to dry. In a relatively short amount of time and with minimal felting effort you can have a whole pile of solid wool stones that you can use in your projects. Choose a wool center that won't bleed color, or choose a color that will work with your design if it does bleed. Grey is a safe choice, red might not be. Some plastic bags are printed with ink that will transfer once wet. Turn your plastic bag inside out and avoid using the printed area. After you rinse your stone, just set it down and let it dry. 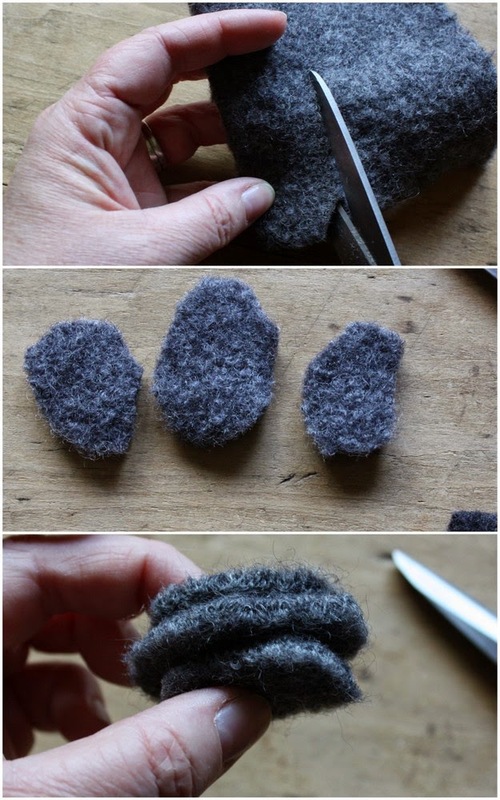 You can trim off any stray fuzzies with small scissors once it's dry. Soon...well, soonish...I'll show you what I did with mine. If you try this out I'd love to see what you're doing with them. Drop me a line or leave a comment and share!